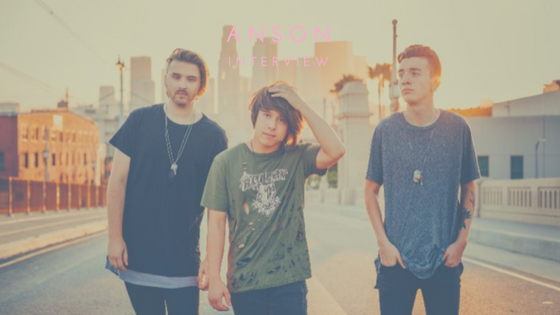 Anson Li was working on his latest EP, To Be or Nothing at All, knowing that he wanted more of a band vibe than a solo vibe. After meeting George Tello and Zack Mueller, the automatic chemistry between the three was exactly what Li was looking for. The project went from Anson Li to ANSON. “Once we all hung out, we realized we all have similar influences and goals and values and from there it just clicked,” he said. Li met Tello and Mueller on separate occasions, inviting them both to be a part of his music video for the title track. Once that chemistry was established, Li shared the finished project with his new bandmates. To Be or Nothing at All was two years in the making, with help from The Wrecks’ production manager Andrew D’Angelo. The album went from demos to testing different musical genres to a variety of phases that was entirely written by Li and even features appearances by The Wrecks themselves. Although Tello and Mueller were not part of the album making process, they have been 100 percent creatively involved since they started working as a three-piece. The vision, the brand, the way they conduct themselves on social media and everything in between is a team effort. “This was originally [Li’s] project but it’s now our vision as a whole,” Mueller said. Mueller recalls the first time the track “To Be or Nothing at All” was shared with him and going into it feeling skeptical, as being a musician living in Los Angeles can more times than not lead into a less than desirable opportunity. However, his skepticism was immediately erased. When Li sent over the rest of the tracks, he shared an even deeper connection to them then he thought he would. It was that moment he was positive that this was a project he wanted to be on board for. ANSON could have easily been another solo record, another one-man band type of deal. Instead, Anson Li found two musicians who shared his passion and immediately jumped on board to promote an already finished record. They’ve each been able to make the tracks their own, and plan to do so even more on an upcoming tour. Their story may have just begun, but they are able to tell this story together.